Back with a baby. Things have been manic, as you might imagine, over the last month so I haven't had a chance to play much. I've done a little bit more Beyond Divinity, but I'm still not realy feeling it. I've just made it to Act IV, which I think is the last Act of the game. I'm in the Raanaar academy and facing many, many more fetch quests before I can assign this to the done pile. They're starting (!) to get a bit silly now, too. One of the last things I had to do in the previous Act was finding the staff of power to open a church vault. The staff was about a hundred pixels away from the church to the North. I knew this because I'd previously found the cave that I couldn't enter. But what was between the church and the cave? A wall. And where did the wall go? Miles around the whole town containing the church, and the church, of course, was at one end of the town while the gates were at the other end. So it took about 10 minutes wandering to get to the cave (with no monsters, they don't respawn, just mindless trudging), then a 5-minute jaunt through the cave to get the staff, then another 10 minutes to get back to the church. Why? What is the point of making me go through that? Is it, on a metagame level, trying to make me realise that life as a fantasy paladin wasn't all spells and swordplay, it was actually a boring life punctuated with brief flashes of excitement here and there? That may be so, but this is a GAME, not a medieval life simulator. Anyway, enough moaning. As you can probably tell, I can't wait to get this one over with. The series list is growing, too, so I need to move ahead soon. I had a few more issues with SubWar so I've put it on the pause pile. I'll return to it later when I have a bit more time and patience. 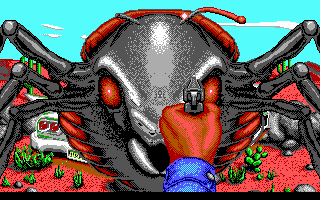 I rolled the randometer, and the next game up was It Came from the Desert, another Cinemaware classic. They were mostly an Amiga company back in the day, so they were only ever on the periphery of my senses because I was mostly a PC guy. Similar to Rocket Ranger it contains doses of strategy and story with action sequences in between. The story is that you're a scientist in a mid-western town (with the very odd name of Lizard Breath), when suddenly giant ants start appearing and attacking the town. It has a great B-movie feel and nice graphics (although they were far better on the Amiga), but again it's giving me DosBox issues. It's not as bad as SubWar, but it's annoying enough that I don't have the patience for it right now. I just want to get into something quick to start my way back on the list. So, again, I'm moving this one to the waiting pile, and I'll spin the randometer once again. Next up is...Bad Dudes (also known as Dragon Ninja). That'll do it! It's a mindless side-scrolling brawler of the type they just don't make any more. It'll probably control horrendously on the PC, but hey. Bring it on.